so, I was featured on school newsletter, obviously ;)! a memorable one. The planning and execution of the programme was entirely done by them. and St. Mary’s Primary School. The programme began with a series of dances, songs presented by the children. The juniors - Abhishek Ghosh, Ayesha, Rajlakshmi, and Ayush presented two lively dances that thrilled the audience to the core. Shivam Gupta (VIII) sang, “Seasons in the Sun” on the occasion. The programme concluded with a sumptuous lunch for everyone. The food was excellent. The kids had arranged a dosa man in the campus to provide piping hot and delicious dosas .The dessert was also superb. Shivam Gupta, Ravi Prakash and Satyam have jointly prepared a video of the entire program. It turned out to be the handwork of professionals. Sincere thanks to Miss Marianne Johannes of Playland and Ms. Mita Verma for guiding the organizers of the programme. It is highly recommended your child be encouraged to read at least one story book during the holidays. Class X (2011) should throw themselves into preparing themselves for the Board Exams next year. This is best time to study. This is the best time to study. Don’t waste your valuable time. Shivam Gupta has developed a 3- animation game which won great press reviews last December. The game created by him is called Terror Attack: Project Fateh which is soon to be released worldwide by India Games Ltd. Mumbai. Shivam has become a sort of hero with gamers the world over, writing to him on Twitter. 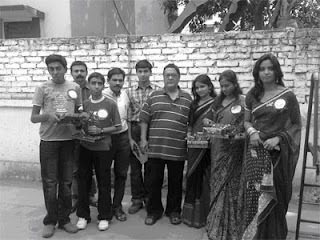 Cricketer in Bangladesh: Saurav (Class X) has taken leave from school. He has been selected to play for the under 17 Indian Team in Bangladesh. Mother’s Day: - On the 7th of May “Mother’s Day “ write up contest was organized for the children. of class X Nausheen and Shiva of class viii, Robin Francis and Satyam of class V and Rajlakshmi of class III . The winners received gifts to present to their mothers. wonderful things about you. Compliment people wherever you go. Be a ray of sunshine to everyone you meet, and make their day better for having seen you.